The resistance of a piece of wire at a constant temperature depends on both the length of the wire and the cross-sectional area of the wire. 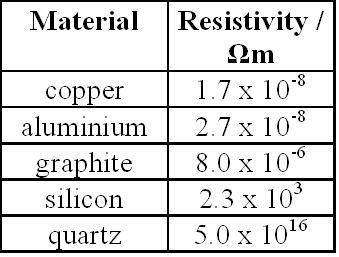 Resistivity (r) is a property of materials which takes account of their resistance (R), length (L) and cross-sectional area (A). 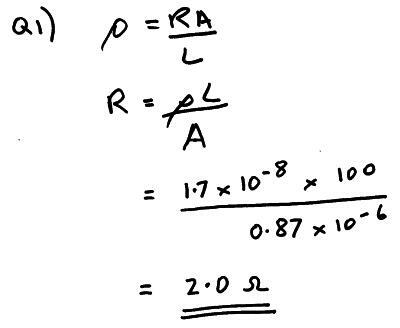 Resistivity is measured in ohm metres (W m). In metals increases in temperature make the atoms in the structure of the metal vibrate more and this makes it more difficult for the electrons to move through the material, so the resistance of the material goes up. An example of this is the filament bulb. 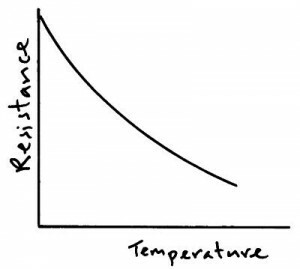 in semiconducting materials the increase in temperature releases more charge carriers so the resistance of the materials goes down. An example of this is the thermistor. 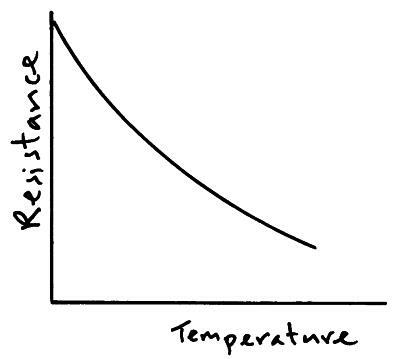 The resistance of a thermistor decreases as it’s temperature increases, this is a negative temperature coefficient thermistor. In some metals and alloys when the material is cooled to a critical temperature (the critical temperature varies with the material but an example of the sorts of temperatures required would be -196 oC) the resistance of the material falls to ZERO. This state of zero resistance is when the materials become superconducting. Superconducting materials are used when very strong electromagnets are required, in MRI scanners or to reduce loses in power cables. Q1) What is the resistance of a piece of wire which is 100 metres long, has a cross-sectional area of 0.87 x 10-6 m2 and has a resistivity of 1.7 x 10-8 Wm?